3 manches avec différents joueurs en fonction du nombre de ceux ci seront effectuées entre 21h et 23h. Plusieurs lots sont à gagner, tel que des Event Tickets & une Box Halloween Hat. There will be 3 rounds with different players depending on the amount of people attending the event. The rounds will be played between 9PM and 11PM. You can win several prizes, such as Event Tickets and an Halloween Hat Box. Although most of the event will be run in French, a special English round will be arranged for players who can't read French. 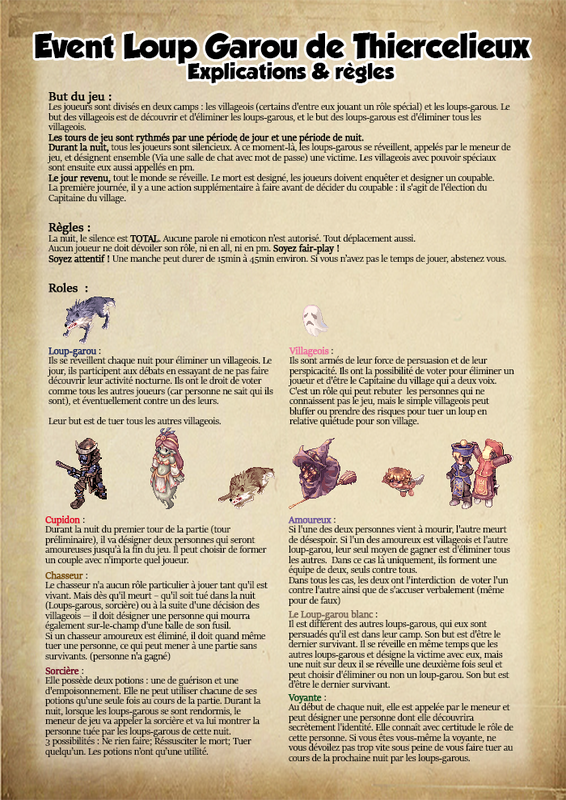 Players are split into 2 sides: villagers (some of them have a special role) and werewolves. Villagers' aim is to reveal and eliminate werewolves. Werewolves' aim is to eliminate all villagers. Game turns are cadenced by daytime periods and nighttime periods. During nighttime periods, all players must remain silent. At that moment, the game master will ask werevolves to awaken and they will select (through a password protected chatroom) their next victim. Once this is done, werewolves will get back to sleep and the game master will ask villagers with special powers to wake up (by PM). When the sun rises again, everyone wakes up. The game master reveals who died overnight, then players have to investigate and name a culprit. On the first day, there is an extra step before investigating: electing the town's Sheriff. This player's vote counts as two in case of draws. Upon his death, he transfers his power to a player of his choice. During nighttime, silence is ABSOLUTE. No talk or emoticon use is allowed, neither does moving. Players must not reveal their role before they die, may it be in the general chat or by MP. Please respect the rules. A round can last from around 15 to 40 minutes. If you don't have enough time to play, please refrain from joining. Event decalé pour raison exceptionnelle.